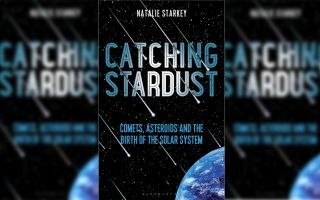 Catching Stardust, a new book by Natalie Starkey, explores our relationship with comets and asteroids. Natalie Starkey has been actively involved in space science research for more than 10 years. She has been involved in sample-return space missions, such as NASA Stardust and JAXA Hayabusa, and she was invited to be a co-investigator on one of the instrument teams for the groundbreaking ESA Rosetta comet mission. Her new book, "Catching Stardust," examines what we're discovering about comets and asteroids — how we learn about them and what the dusty, icy rocks have to share about the origins of the solar system. Read a Q&A with Starkey about her new book here. Over the course of the past 50 years, space instrumentation has become more and more advanced as humans have pursued a varied number of different objects in our Solar System to image, measure and sample. Humans have successfully placed a fully functioning rover on the planet Mars to roam over its surface, drilling and collecting samples to analyse on-board its cargo of scientific instruments. A sophisticated scientific laboratory has also been sent into space on a decade-long journey to catch up with and land on a speeding comet to perform analyses of its rocks, ices and gases. And this is to name just a few of the more recent highlights of space exploration. However, despite these advances and amazing achievements, the best and most easily controlled scientific instruments exist on Earth. The problem is that these Earth instruments can't be sent into space very easily — they are too heavy and sensitive to launch aboard a rocket and they need near-perfect conditions to perform with precision and accuracy. The space environment is not a friendly place, with substantial extremes in temperature and pressure, conditions that are not suited to delicate and, sometimes, temperamental laboratory instruments. The Stardust mission, in particular, achieved a great deal in furthering our knowledge of the composition of comets. The comet dust samples it returned to Earth will keep scientists busy for many decades to come, despite their limited mass. We will learn more about this mission, and the precious samples it collected, in Chapter 7. Luckily, there are future plans for collecting rocks from space, with some missions already on their way and others awaiting funding. These missions include visits to asteroids, the Moon and Mars, and while they may all be risky endeavours with no guarantee that they will achieve their goals, it is good to know there is hope for the return of samples from space for Earth-based analysis in the future. Luckily, it turns out that there's another way to obtain samples of space rocks and it doesn't even involve leaving the safe confines of Earth. This is because space rocks naturally fall to Earth as meteorites all the time. In fact, some 40,000 to 80,000 tonnes of space rocks fall onto our planet each year. These free space samples can be likened to cosmic Kinder Eggs — they are packed with celestial prizes, information about our Solar System. Meteorites can include samples of asteroids, comets and other planets, most of which haven't been sampled by spacecraft yet. If all these space rocks naturally arrive on Earth for free, then you might wonder why scientists bother going to the trouble of visiting space to attempt sampling at all. Despite the fact that the rocks falling to Earth sample a much wider range of Solar System objects than humans can visit in many lifetimes, these samples tend to be biased towards those that can best survive the harsh effects of atmospheric entry. The issue arises because of the extreme temperature and pressure changes experienced by a rock, or any object, during atmospheric entry from space to Earth, variations that are large enough to totally obliterate a rock in many cases. Temperature changes during atmospheric entry occur as a direct result of the high incoming velocity of the object, which can be anywhere from around 10km/s to 70km/s (25,000mph to 150,000mph). The problem for the incoming space rock when travelling at these hypersonic velocities is that the atmosphere can't move out of its way quickly enough. Such an effect is absent as a rock travels through space, simply because space is a vacuum so there are too few molecules present to knock into each other. A rock travelling through an atmosphere has a buffeting and compressing effect on the molecules it encounters, causing them to pile up and dissociate into their component atoms. These atoms ionise to produce a shroud of incandescent plasma that is heated to extremely high temperatures — up to 20,000 degreesC (36,032ºF) — and envelops the space rock, causing it to become super-heated. The result is that the rock appears to burn and glow in the atmosphere; what we might call a fireball or a shooting star, depending on its size. Despite the formation of a fusion crust, the effects of atmospheric entry can be rather harsh and destructive. Those rocks with lower compressive, or lower crushing, strength are less likely to survive the experience; if an object survives deceleration through the atmosphere, then its compressive strength must be more than the maximum aerodynamic pressure it experiences. Aerodynamic pressure is directly proportional to the local density of the atmosphere, which is dependent on which planet an object encounters. So, for example, Mars has a thinner atmosphere than Earth that doesn't act to slow down incoming objects as much and explains why space engineers have to think very carefully about landing spacecraft on the red planet's surface, since their deceleration systems can't be pre-tested on Earth. The compressive strength of a rock is controlled by its composition: its proportion of rock minerals, metals, carbonaceous material, volatile phases, amount of pore space and how well its component materials are packed together. For example, hardy space rocks, such as those from the iron- rich asteroids, tend to survive the extreme changes in temperature and pressure as they hurtle at great speed through the Earth's atmosphere. The stony meteorites are also quite robust, even when they contain little or no iron. Although iron is strong, rock minerals themselves can be very well- bonded to create a tough piece of rock, too. The meteorites that are less likely to survive atmospheric entry intact are those that contain a higher percentage of volatiles, pore space, carbonaceous phases and so-called hydrated minerals — those that have accommodated water into their growth structure. Such phases are in high abundance in the meteorites known as carbonaceous chondrites and also the comets. These objects are, therefore, more sensitive to the effects of heating and cannot withstand the aerodynamic forces they experience as they travel through Earth's atmosphere. In some cases, they are nothing more than a loosely consolidated handful of fluffy snow with some dirt mixed in. Even if you threw a snowball made of such a mix of materials you might expect it to disintegrate in the air. This demonstrates why a large sample of a comet is generally considered unlikely to survive the harsh pressure and heating effects of atmospheric entry without melting, exploding or breaking up into very tiny pieces. As such, despite the large collections of meteorites on Earth, scientists are still not certain that they have found a large meteorite specifically from a comet because of the extremely fragile structures they are expected to have. The result of all this is that some space rocks are over-represented as meteorites on Earth simply because their compositions withstand the effects of atmospheric entry better. Excerpted from Catching Stardust: Comets, Asteroids and the Birth of the Solar System by Natalie Starkey. Copyright © Natalie Starkey 2018. Published by Bloomsbury Sigma, an imprint of Bloomsbury Publishing. Reprinted with permission.